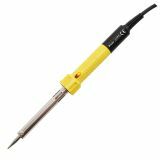 Soldering iron SLD-GUN-100W/BX-CHR, non-adjustable, 230VAC, 100W, induction soldering iron, straight tip 100 watt induction soldering iron to help you reach the operating temperature quickly. Gun type handle for convenience in long work. 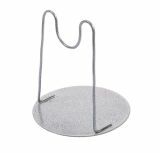 Soldering iron stand, metal Comfortable soldering iron stand. Soldering iron, 220 VAC, 30 W, straight tip Unregulated electric soldering iron with a power of 30 W and an operating voltage of 220 VAC. Soldering iron, ZD-30C, 220 VAC, 40 W, straight tip, blue Unregulated electric soldering iron ZD-30C with a power of 40 W and an operating voltage of 220 VAC. Blue. Soldering iron, Тopex 44E024, 220VAC, 40W, straight tip Unregulated electric soldering iron Тopex 44E024 with a power of 40 W and an operating voltage of 220 VAC. Soldering Iron SI-129B-40, 220VAC, 40W Soldering Iron SI-129B-40 with supply voltage 220 VAC, power consumption 40 W and made of high quality materials for safety and convenience. Soldering iron, ZD-30C, 220 VAC, 60 W, straight tip, blue Unregulated electric soldering iron ZD-30C with a power of 60 W and an operating voltage of 220 VAC. Blue. Soldering Iron SI-129B-60, 220VAC, 60W Soldering Iron SI-129B-60 with supply voltage 220 VAC, power consumption 60 W, made of high quality materials for safety and convenience. Soldering iron 100W, 280°C Soldering iron "Skitia" 74216 with operating voltage 220VAC and power 100W. Made in Bulgaria. Soldering iron, ZD-715L, 220VАС, 200W Soldering iron ZD-701B with operating voltage of 220 VАС and nominla power of 200 W.
Soldering iron 74207, 220VAC, 250W, curved tip Soldering iron 74207 with operating voltage 220 VAC and rated power 250 W.
Soldering iron, ZD-701, 220VAC, 300W, curved tip, grey Unregulated electric soldering iron ZD-701 with a power of 300 W and an operating voltage of 220 VAC. Grey. 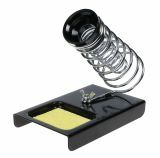 Soldering iron stand, HS-81, metal Soldering iron stand model HS-81mede from metal spiral. Soldering iron ZD-929, 24V, 48W Soldering iron ZD-929 with supply voltage 24 V, power 48 W for soldering station with temperature probe. 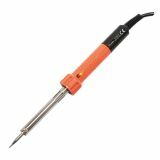 Soldering iron, 36VAC, 40W, curved tip Soldering iron woth operating voltage of 36 VAC and nominal power of 40 W.
Soldering Iron, SI130B-15, 220VAC, 10W, ceramic, straight tip Soldering Iron SI-130B-15 with operating voltage 220VAC and power of 10 W.
Soldering iron 9SS-201-IRON Soldering iron 9SS-201-IRON for soldering station SS-201. Induction soldering iron, 220VAC, 100W, ETP III Inductive soldering iron with operating voltage of 220VAC and nominal power of 100W, ETP III. List Price 57.00лв. VAT Incl. 54.14лв. VAT Incl.